The Shrine was erected on April 30, 2000, at the site of the revelation of Merciful Jesus and the beginning of the prophetic mission of St.. Faustina Kowalska. In the convent of the Sisters of Our Lady of Mercy in the Old Market Square, Jesus asked Sister Faustina to paint His image according to the directions he revealed to her in the vision of 22 February 1931, and then to establish the Feast of Divine Mercy. That is why this place is so vitally important not only for the venerators of Divine Mercy, but for the entire Church, which is alive in our time with the message of devotion to Divine Mercy in the forms that Jesus provided to St. Faustina. The Shrine of Divine Mercy in Plock is visited by more and more pilgrims from Poland and the entire world. Hence the need to build a new church with facilities for the pilgrims. Currently, the services take place in the small chapel of the convent of the Sisters of Our Lady of Mercy. The first step comprised construction of laying foundations, basement walls, ceilings over the basements of the church and the pilgrim house, and historic restoration of a bread oven. These works were completed by the end of 2015. See photos. The second stage included the reinforced concrete structure of the church nave and the chancel. In 2016, the walls, pillars and all ceilings were constructed. See photos. 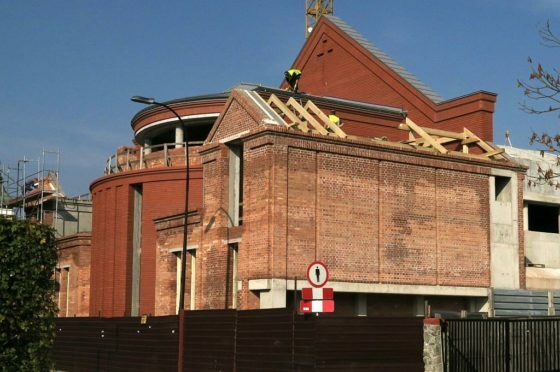 For 2017-2019, the third stage of implementation is planned, including the construction of the remaining part of the reinforced concrete structure of the church, the pilgrims’ house, and all works related to the façade and the roof. See photos. The fourth stage will cover all finishing, installation and land development works. The third stage is currently underway. The ferro-concrete construction of the church containing a part of the main nave, the chapel and the tower is in progress. See photos. The Shrine of the Divine Mercy in Plock is being erected by the Congregation of the Sisters of Our Lady of Mercy, thanks to the donations made for this purpose by devotees of Divine Mercy and people of good will. Sisters, thank you for every gift of the heart that makes the place of the first revelation of Merciful Jesus to St. Faustina. Thanks to these gifts, the church is growing and therefore the sisters would like to ask for further support. Holy Mass is celebrated on the 22nd day of each month and the Sisters pray daily together with the faithful at the Hour of Mercy and with the Chaplet of Divine Mercy in the intention of everyone who support the construction of the Shrine spiritually and physically. The form of the Shrine is the result of a combination of spatial, functional and sacral requirements. 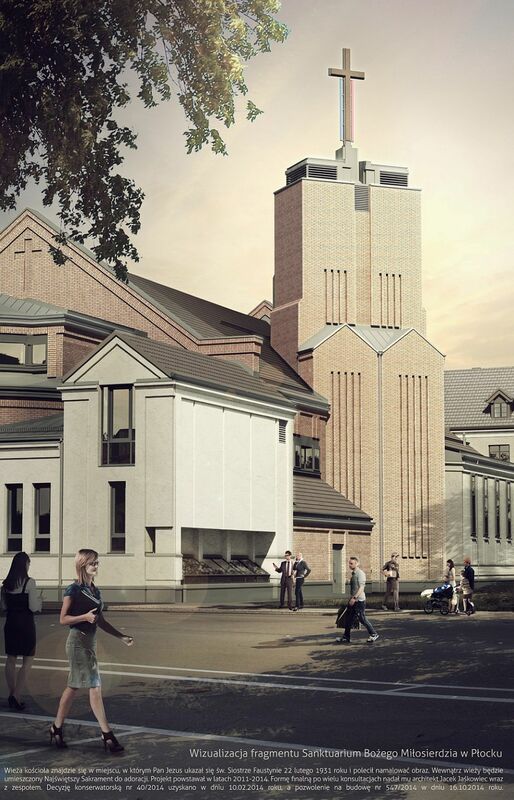 The new building will harmonize with the character of the old town in which it is located and the adjacent buildings. It has received an adequate scale and detail in order not to instigate neighborly conflicts. Only the tower, referring, in its size and character, to the tower of the Marshal St. Małachowski High School nearby, stands out from the form of the church. The lack of a typical square belonging to the urban space associated with the Shrine gives the complex of buildings an “indoor” character, which favors an atmosphere of calm and concentration. The Shrine is a group of buildings housing many functions. Prior to the expansion, existing houses of the Old Market Square were intended to meet all the functional requirements, with a modest effect. The functions were mixed, and there were no sacred zone. Hence the necessity to create a space for the church and chapel. Because the Shrine is visited by pilgrims from around the world, rooms were also added to accommodate them. A café, lecture halls and a museum were created. Finally, what distinguishes the Shrine from the others is the fact that at this very place St. Faustina Kowalska received an order from the Lord Jesus to spread the Divine Mercy devotion and to arrange the painting of an image of Merciful Jesus. The exact spot is marked by the tower, whose one-space interior stretches from the museum in the basement to the skylight and the dome crowning it. The whole foundation is subordinated to the shape of the new church, whose roof, withdrawn deep into the area, fits non-aggressively into the street buildings. It can be accessed from different sides: from the inner square, from the Market Square, and through the chapel. The two new sacral spaces of the church and the chapel can be used separately or together, by opening the glazed walls that divide them. The internal communication system is planned in such a way that it allows for different variants of the use of the new Shrine.